Truth from the Heart: The Tale of Three Good Country Women: Cigarettes, Bloody Marys, and Mediocrity. The Tale of Three Good Country Women: Cigarettes, Bloody Marys, and Mediocrity. When traveling past the red brick colonial manor on Montgomery St., the one with the wide front porch and tall white columns, you could be sure to find three middle-aged women resting contently on three pristinely white wicker chairs. Cigarettes in hand, Bloody Marys nearby, you could safely take a gamble that their topic of discussion lies somewhere in between the most tasteless outfit seen at Sunday services and the ill-manners of every child in town under the age of 35. Then, they would all agree that things were not the way these used to be … in the good old days. “I don’t know why ya’ll worrying over an unfaithful minister’s affairs when there are great travesties going on in this troubled world,” interrupted Mrs. Bradley, who had been half-listening to her friends conversation while studying her neighbor who had just driven up to her house in a station wagon filled with groceries. “There are hungry children living only a few blocks down from your house, Johanna, and the way your grandchildren speak to you, Doreen … why, I declare, either their parents are deaf or our youth has lost their manners as well as their minds.” As she spoke, all three woman blankly stared at the tired woman across the street, slowly making trip after trip from her car to her front door, arms full of groceries. “Bless her dear heart,” said Johanna. And all three rose from their squeaky chairs and went inside. Front porch conversations, spoken at ease regarding troubled topics, are familiar to us all. More often than not, we find ourselves, in between sips of coffee, speaking of shameful deeds of shameful people — not slandering any close friend’s names, but simply stating the facts. We rest our heads at night, content that we put in our few hours at the soup kitchen that week, but disheartened that there is still so much crime, death, and suffering in the world. Although the three women in the above story are nauseatingly presumptuous, we must admit that their afternoons would be ideal for any person wishing to live a life free from depressing self-reflection, troublesome guilt, and all the burdens of facing the possibility that we are weak, sinful, and imperfect. It is a life which many of us “good country people” already lead. Many of us come to accept our inadequacies, whether that means we aren’t the friendliest neighbor, most diligent employee, or most patient spouse. We have accepted the fact that we’re “good country people.” Living a neutral life protects us from the uncomfortable demands of piety, holiness, and all other forms of extreme morality. Not everyone can be the hero of the story and many of us are happy standing in the background. We won’t openly speak of our complacency, for to accept mediocrity is to accept despair, but we go about our days acting as if it doesn’t bother us. But eventually it does. The homeliness of mediocrity is honestly quite repulsive. And the beauty of the virtues is undeniably attractive. Nonetheless even good deeds can become stale and ordinary if they are not permeated with supernatural life. In her introduction to her husband’s work, Transformation in Christ, Alice von Hildebrand writes, “There lies a great chasm between natural virtues and supernatural virtues”(xi). 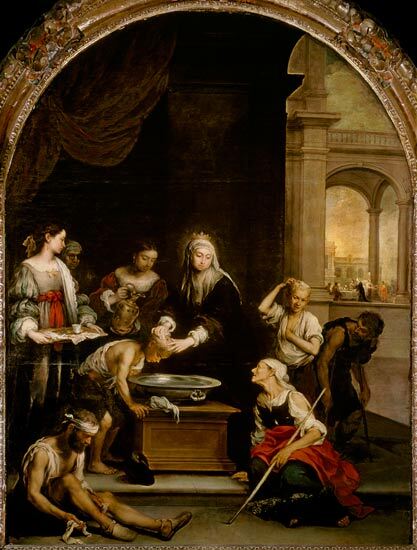 For instance, it is honorable when a man humbly denies a compliment, but how more splendid and remarkable is the act of St. Elizabeth of Hungary who gave her royal bed to a sick beggar. The truth is this, simple but not plain: all good country people are meant to be extraordinary heavenly saints. This is a reality we must learn to accept and then respond to. The longing in our hearts to rid our streets and our homes of the evils which prey on our children can only be realized by an abandonment of self and a readiness to allow our “character to be stamped with a new coinage, a new face, as it were, whose features far transcend human nature and all its possibilities”(6). No man can live his life entirely undisturbed by the blatant injustices of this world. But the cure to hatred, crime, and disorder of any country, state, or town lies in the souls of its people. My plea to my readers in this article is also a personal prayer: let’s not be content, self-satisfied “good country people”. For the sake of our nation, our towns, our families, our children, let us rise above, be renewed, be made into new men and women. This leaves us with an age-old conundrum: when we see the value in a change of heart, how can we make this change occur? For it is easier said then done. “Rare are those (and they are properly known as saints) whose readiness to change is total, absolute, unconditional,....How hard it is for us --- the sons of Adam -- to speak truly and fully the words of Christ: ‘“not as I will, but as Thou wilt’”(ix). Therefore, if we must sit at on our front porches and speak of how things used to be or ought to be, then let us also be men and women who stand up from our seats to meet the world in the same way we meet our faces in the mirror, with “an inner readiness to ‘put off the old man’ — a readiness to become something fundamentally different”(3). Charity begins at home, in the heart, or even on a front porch. By looking at the content of your blog, I was really amazed how you have described all the tale of the 3 good country. This is worth in reading which will give me some fun while using the juulwraps at home. Despite of the busy days from work, I think I'm going to relax for a short time. I love how the way you write about the tale of the three good country. My time is not wasted. I really love reading blogs, its my pass time as well as making Custom Juul Skin it makes my life a little exciting and fun. I love expressing myself in writing and creating Juuls.